There is nothing particularly interesting in the basic bottom job. To me it is the worst job in a boatyard. 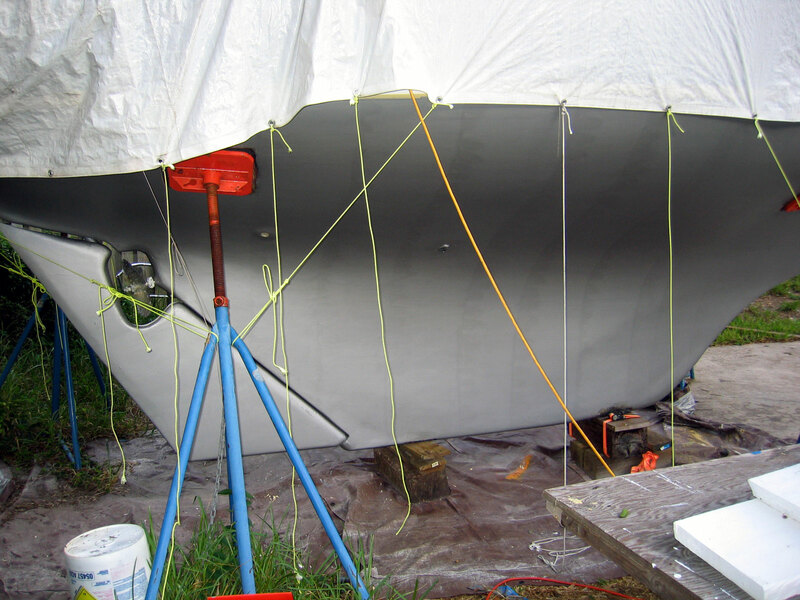 In 1988 I sand blasted 20 years of bottom paint off the boat, and applied an epoxy barrier coat. But not that much was known about barrier coatings in 1988 and I didn't apply as many coats of epoxy as is recommended by West Systems now. So I took these summer months when it is 120 degrees in the cabin to rework the bottom the way it should be. The steps I followed are shown on the right. I will show the details here of how to remove and patch a thru-hull as I have removed and patched four of them and only added one. 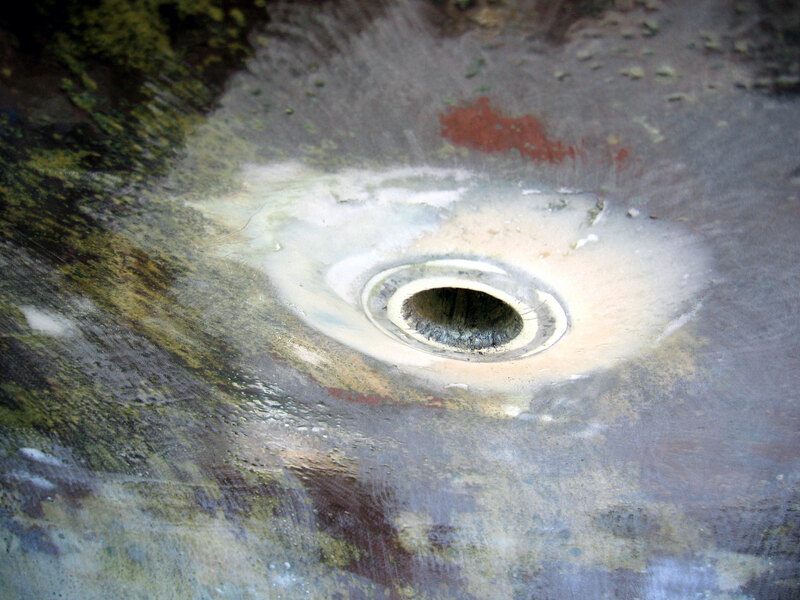 Here is the head discharge thru-hull on the port side. It is a Forespar Marelon thru-hull, as all the thru-hulls are. The trouble is it is located not in the head area but under the port vee berth. So it needed to be moved. 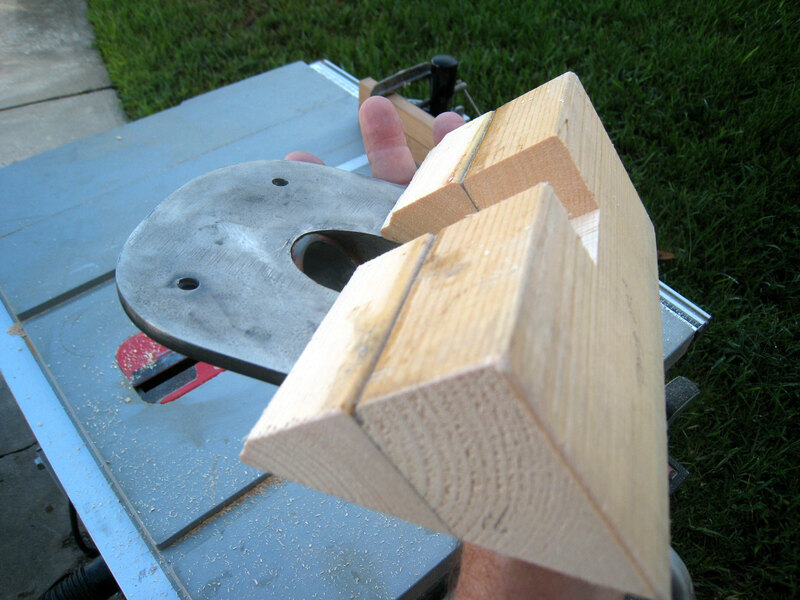 So, to remove, I took a Japanese saw with zero kerf and sawed off the head of the thru-hull. I assumed if would be a quick job, but the Marelon is really tough stuff and took a long time even with a fresh saw. You can see the tan colored 5200 under the head in this photo. 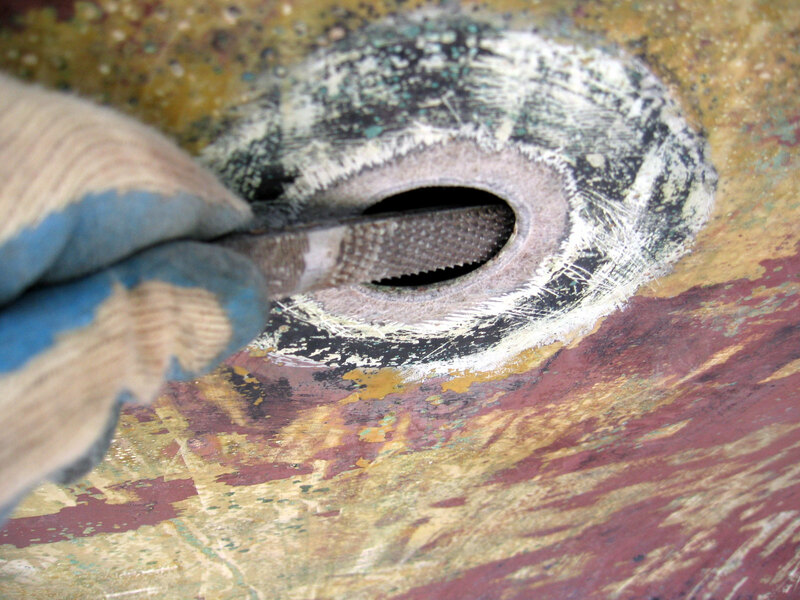 Once the head is removed it is not difficult to twist off the ball valve from inside the hull and extract the remains of the thru-hull. Once the 5200 is cleaned off, take a rasp and bevel the outside edge all around to create a bevel half the radius of the hole. 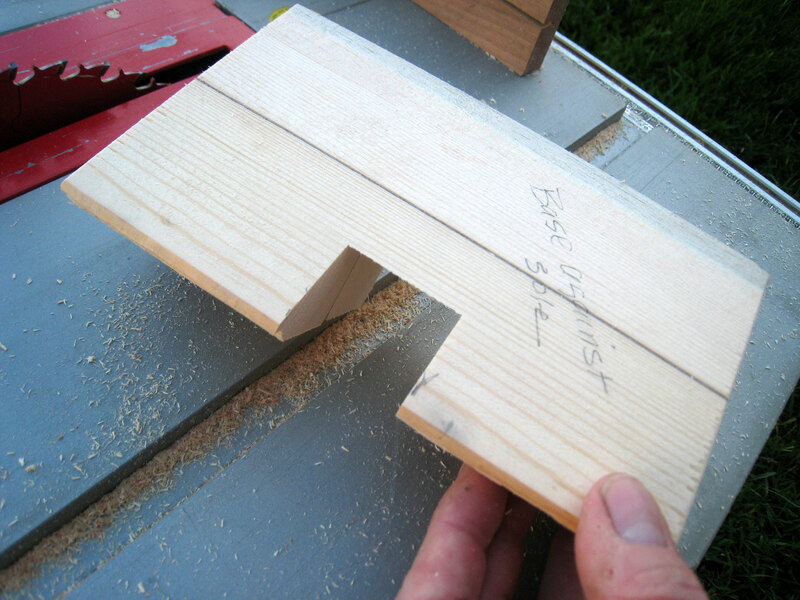 Now do the same bevel to the inside of the opening. I use three layers of 24 oz biax mat and roving, each layer cut in a larger circle (the last layers the diameter of the fully beveled edges to fill each side of the opening. 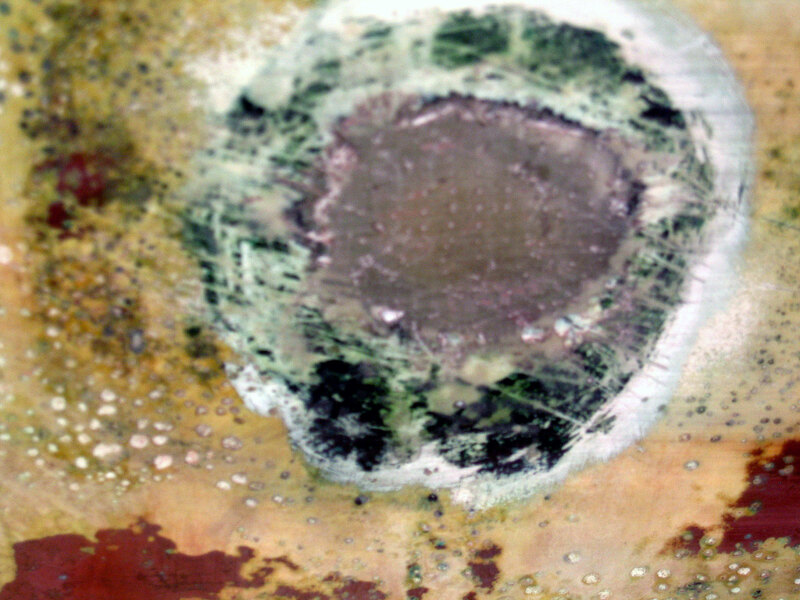 To help the layers stick, paint the edges with unthickened epoxy first and wait until it just starts to kick. Before the biax dries hard, add the first application of thickened epoxy and let it set for 48 hours before sanding. Use a high density filler. Here is the first sanding. Fill again with low density microballs to get the patch smooth as the surrounding hull. 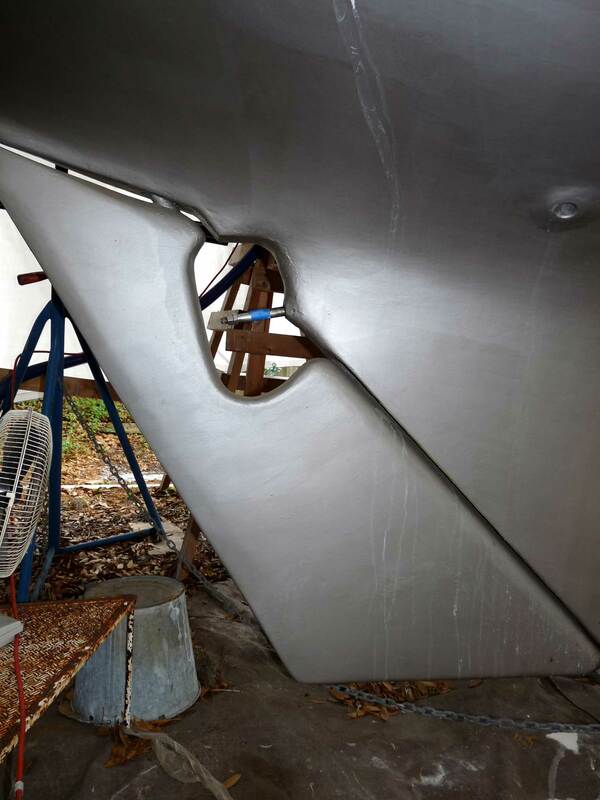 Here are two thru-hulls on the port bow patched, and one remaining thru-hull for a raw water inlet faired. 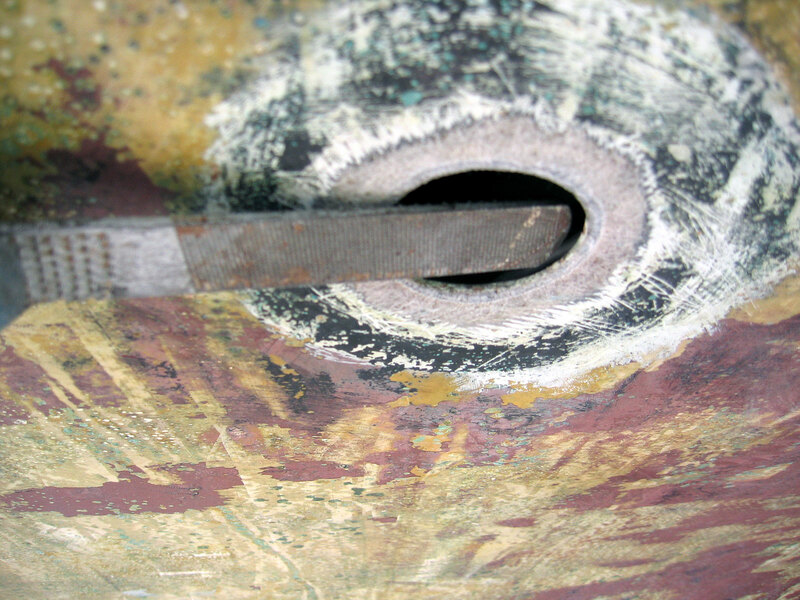 One of the four cockpit drain thru-hulls faired to the hull. 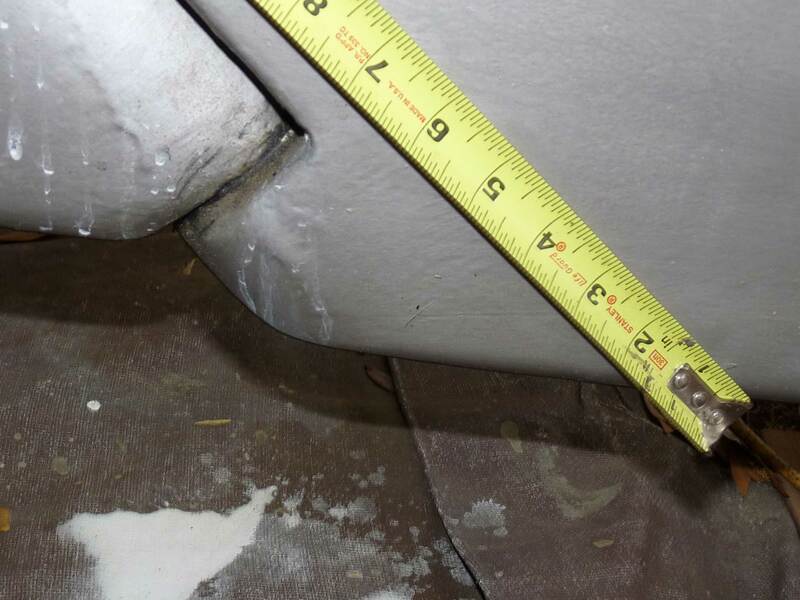 Here is the sink drain on the starboard side patched and smooth, ready for barrier coating. This is a good venue to point out some important elements of the rudder. After 20 or 30 years the rudder tends to wear the pintel our of round, giving a vibration or shutter to the tiller when the boat is sailing hard. 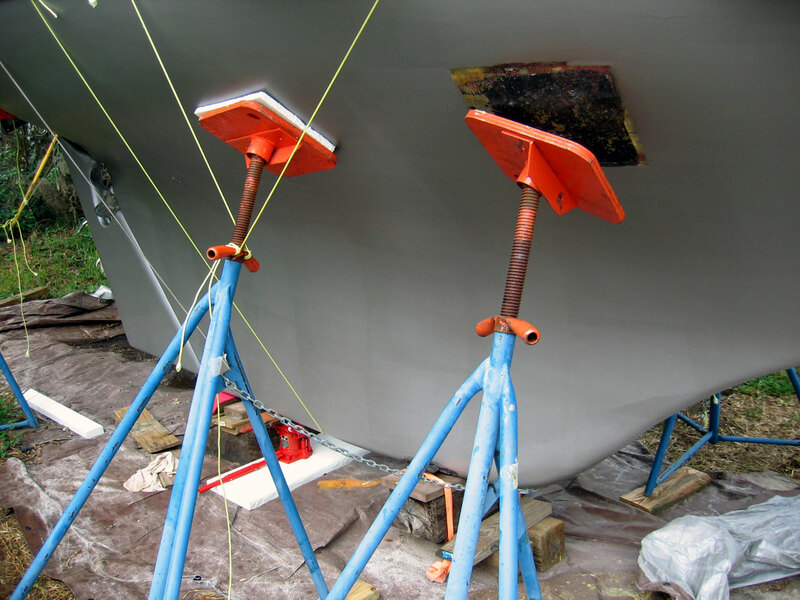 It's nothing to worry about, and common with keel hung rudders. If you wish to remove the rudder, follow this write up. 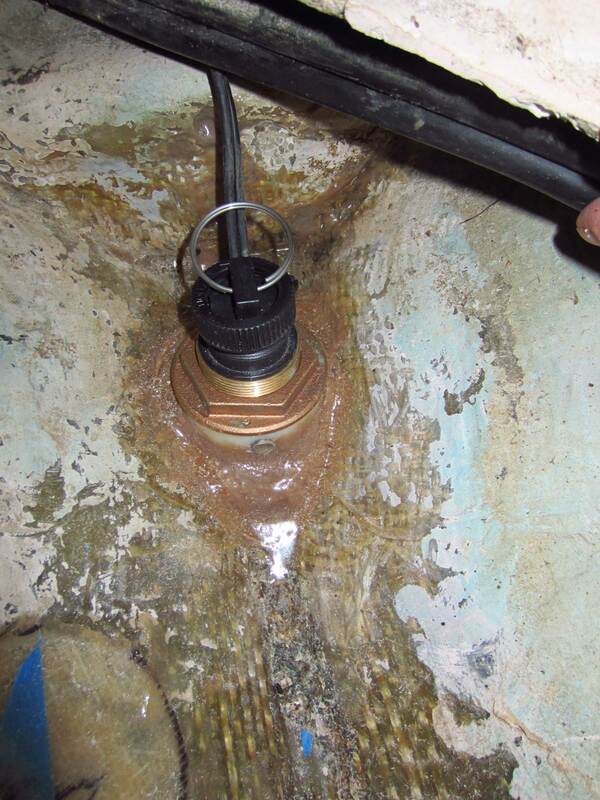 You can get to the pintel by uncovering the mounting bolt (shown in the photos below. This is the starboard side of the rudder and the rudder shoe. 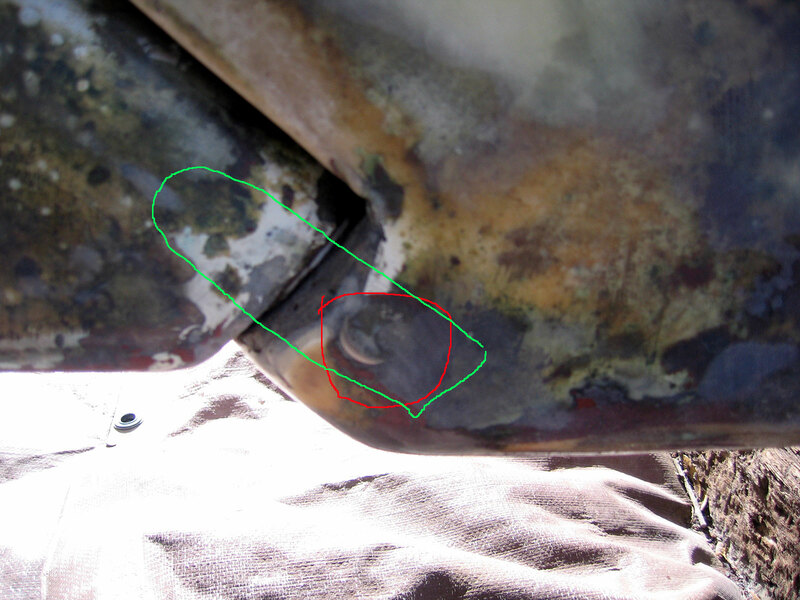 The red circle shows a hint of the bolt that secures the rudder shoe pintel. 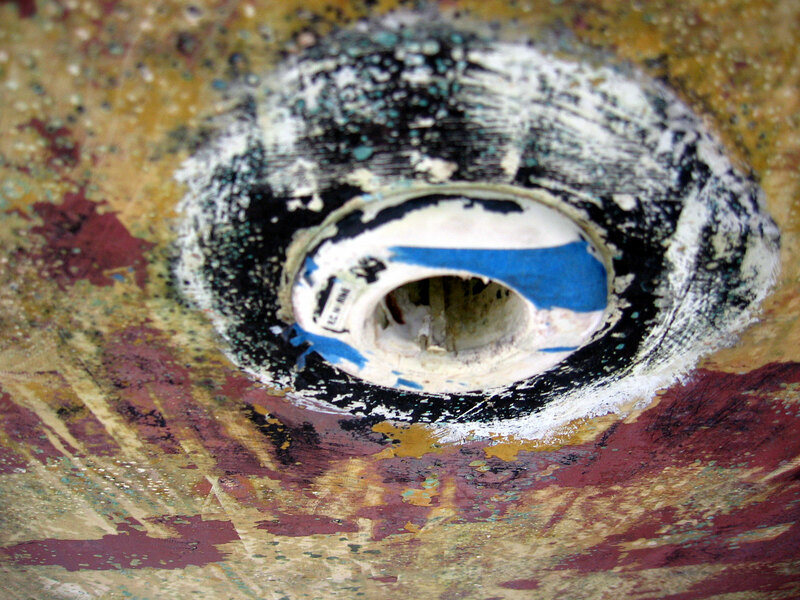 The stainless bolt mounts through the rudder shoe, and through a hole in the pintel, locking it in place. 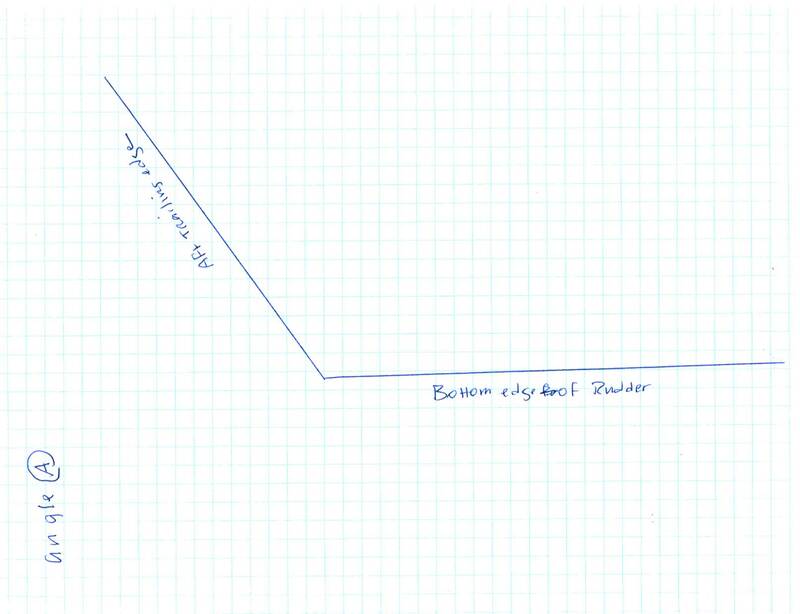 The green line poorly represents the pintel's position. 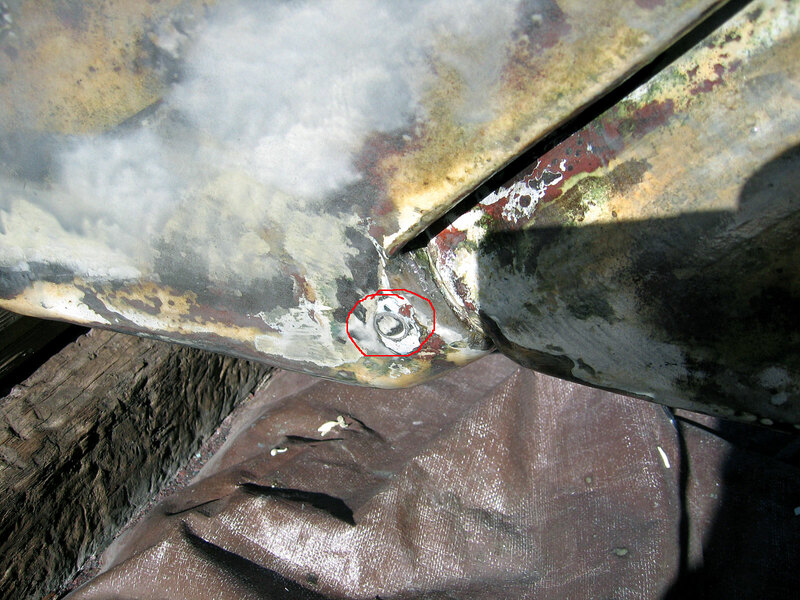 This shot shows the port side location of the pintel mounting bolt. Both sides will be covered (or should be) with polyester resin. Sand the area lightly to reveal the bolt. 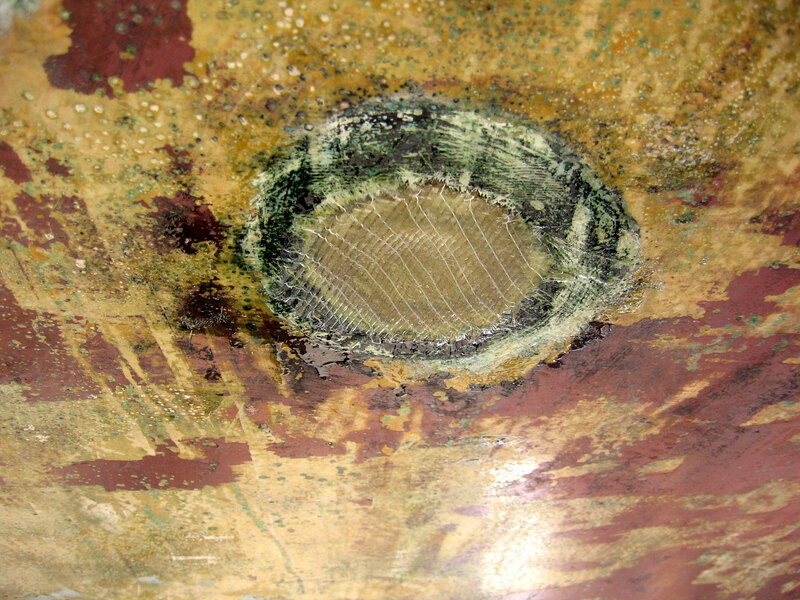 Cover with epoxy when you are finished. When you are hauling your B29, be careful not to allow the sling to be positioned under the rudder. 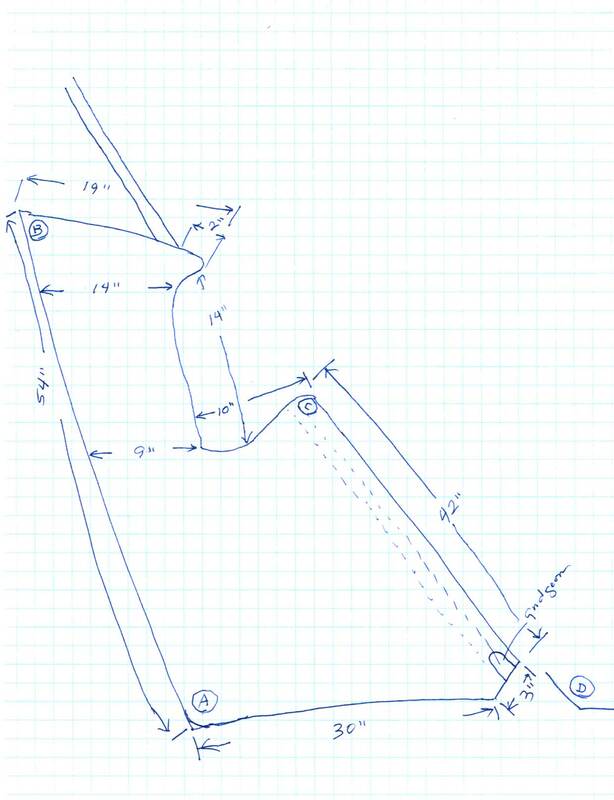 If you tell the yard that the rear edge of the sling should be a couple of inches forward of the aft edge of the aft-most portlight, you will be safe. Just to be sure as the travellift operator takes up slack in the slings, move the tiller to be sure the sling isn't binding against the bottom edge of the rudder. You will bend your rudder post if you let some idiot sling under your rudder. By the same token, do not let your yard block your B29 under the rudder shoe--it is strong, but not built for that sort of stress. Be sure the rear edge of the block is a good 8 inches forward of the shoe. 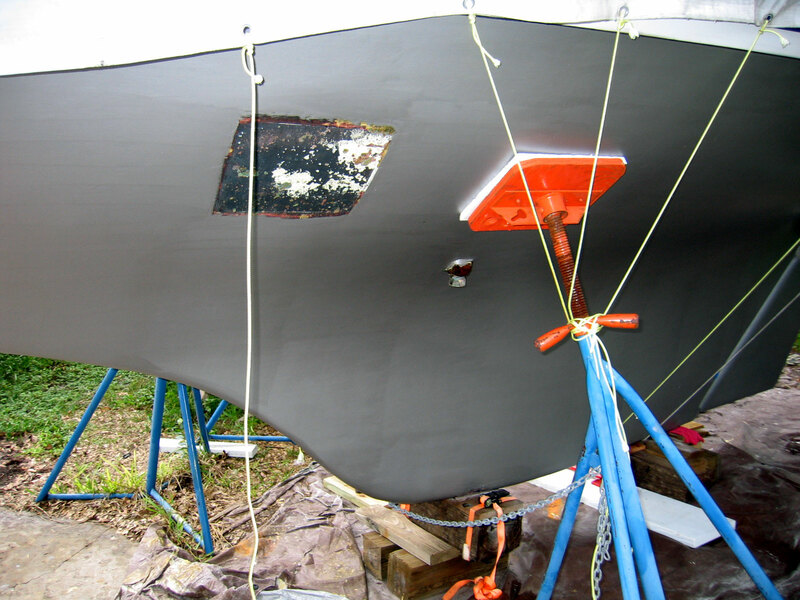 Here is the starboard side barrier coated with the West 422 stuff. The roll and tip dried very smooth. Here is the starboard side with the first coat of Primocon. The primer went on very easily and leveled nicely. I rolled and tipped it like I did with the epoxy. 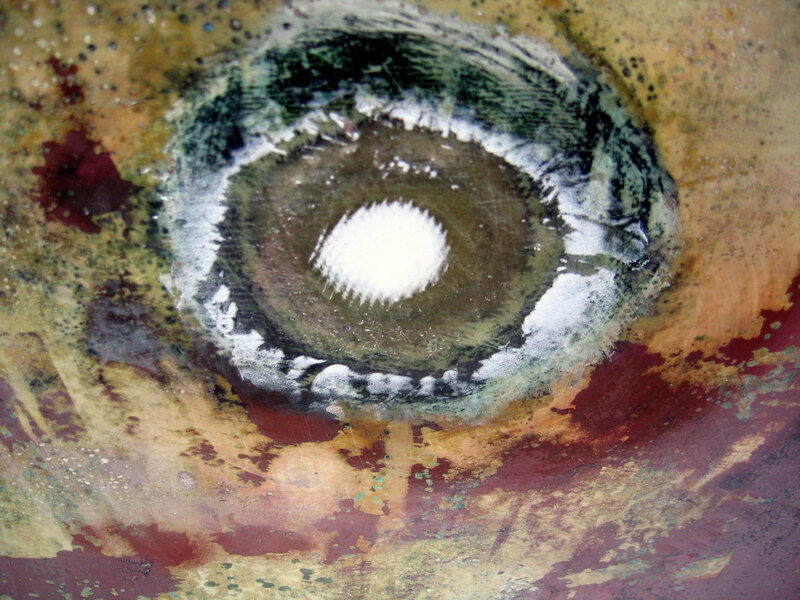 The Primocon needs a lot of stirring as it looks like metallic paint that needs constant mixing. It took almost a quart to do one side, one coat. Once the bottom is finished, I still need to move the blocks under the keel and the jack stands. 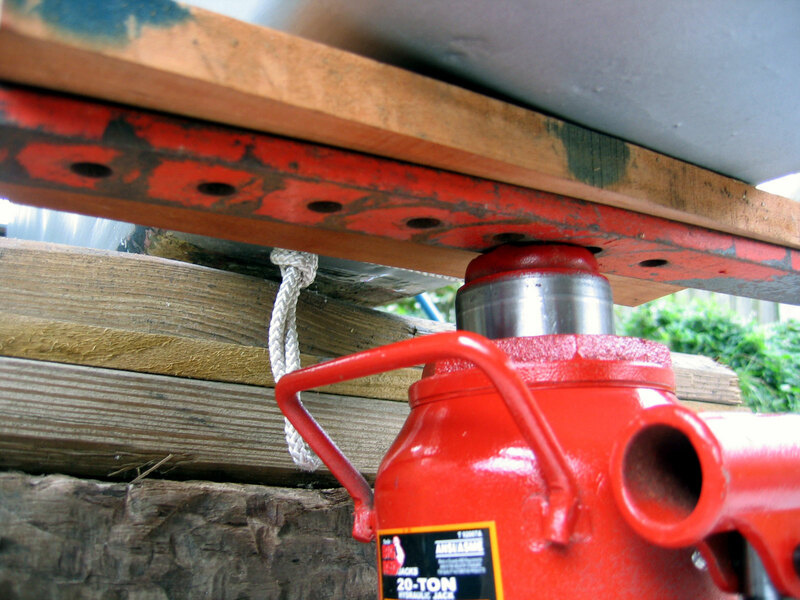 Here I am using a 20 ton low profile bottle jack to lift the stern. I used a piece of scrap steel to spread the force evenly and a piece of cherry to protect the keel. When I ordered my jack stands from West Marine, I ordered 5 so I could do this: move any stand and still have 2 supporting at all times on each side. I used some 1-inch thick Styrofoam under the jack stand bases to protect the finish. Here is my propeller. I just got it back from Hall's Propeller Shop in Christmas, FL. They reduced the pitch by one inch, cleaned, balanced and polished it. 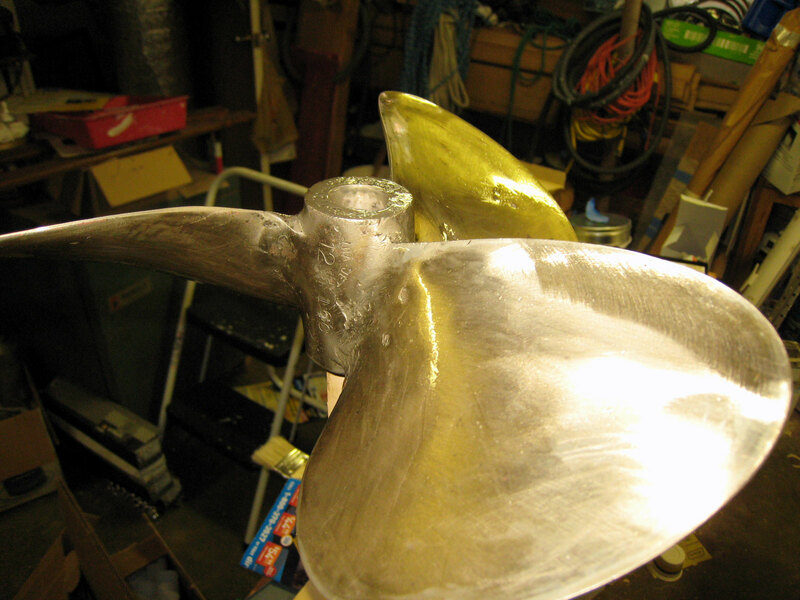 They have been caring for this propeller for the past 18 years and it is still in very good shape. It is 12" diameter by 15" pitch which with the Hurth 2.61 to 1 transmission on the Yanmar 3GM30F, gives me hull speed at about 1800 rpm. It's a great little prop. You can see that barnacles have taken a few bites in it. This refit I am going to try a different procedure to keep anti-fouling paint on it. I am using West Systems' method of epoxy bonding in which you first clean the surface to be bonded with acetone, then immediately wet sand with epoxy to work the epoxy into the metal. I have just finished that step in the picture. Next I will paint on two coats of epoxy. 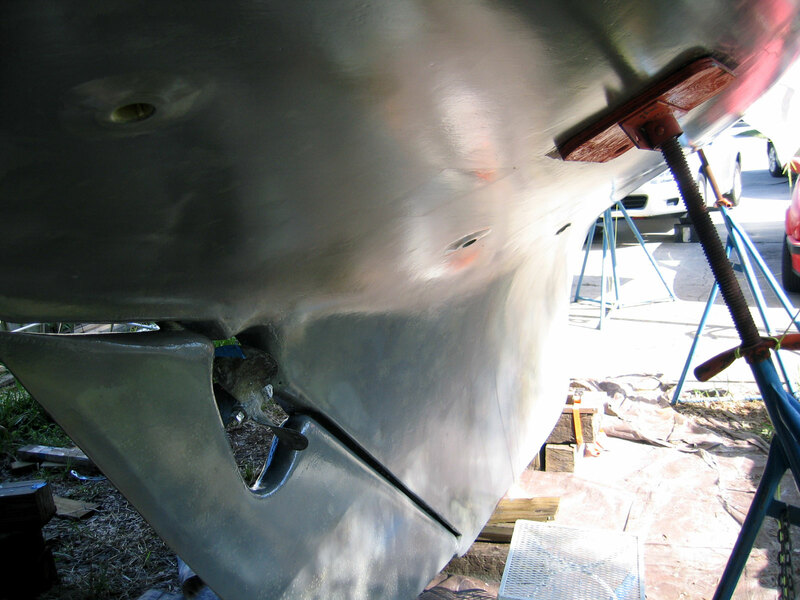 Then add antifouling paint when I am ready to launch. I'll let you know if it works. 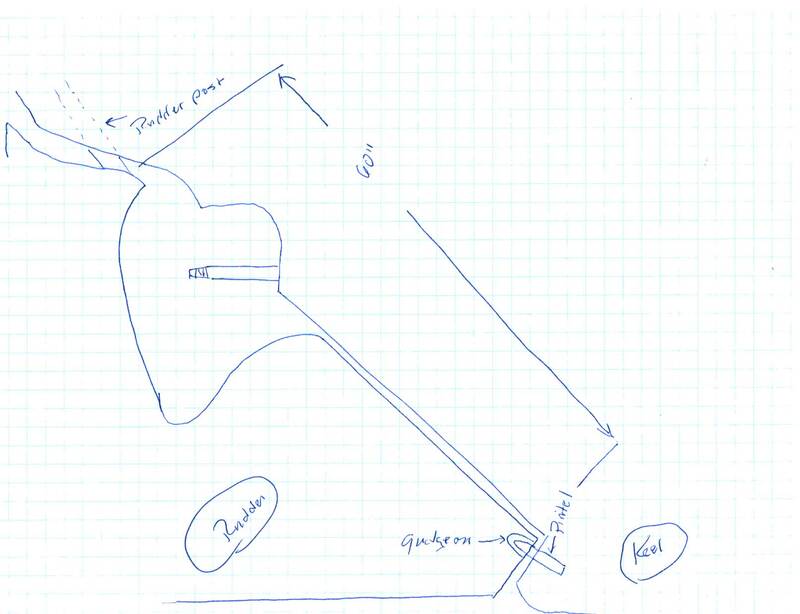 At the request of one Bristol 29 owner, currently in Guam, having destroyed the bottom half of his rudder on a reef, I am including more detailed information and dimensions for building a new rudder. Overall photo of rudder. 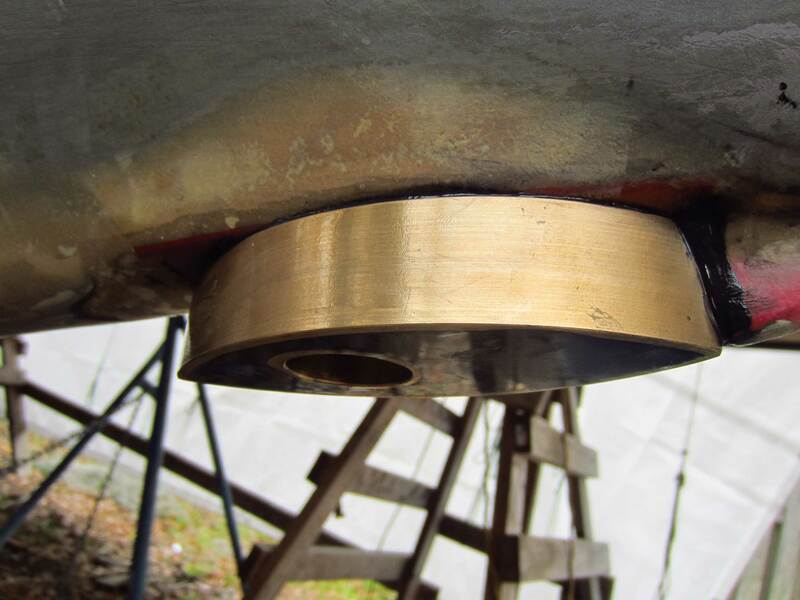 Rudder post is 1-1/4" solid bronze, supported in three places: at the bottom where the rudderpost ends in a hollowed out cup or gudgeon to receive the pintel. 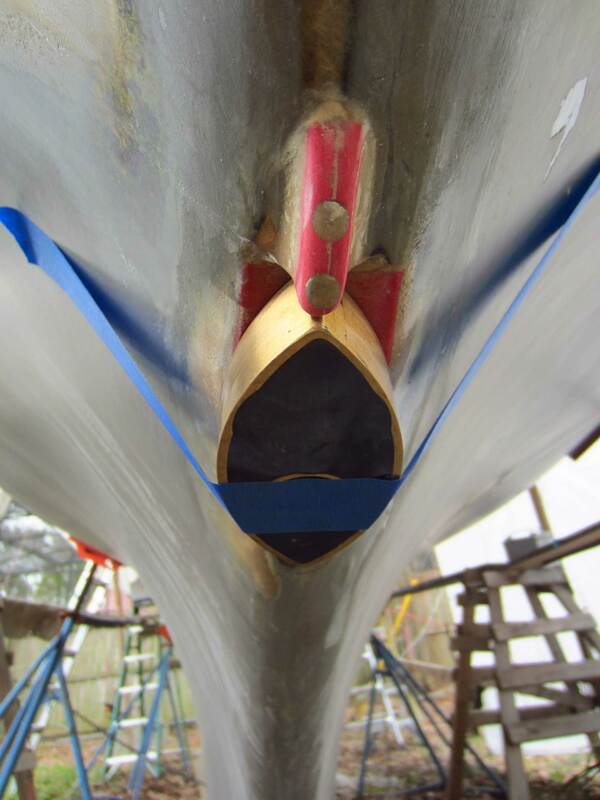 The pintel is a 1/2" diameter pin rounded at the head to match with the gudgeon that is let into the rudder shoe. It "floats" in this hole and is secured with a 5/16" machine screw that passes thru a hole drilled in the foot of the pintel. The length of the bolt is basically the thickness of the rudder shoe. 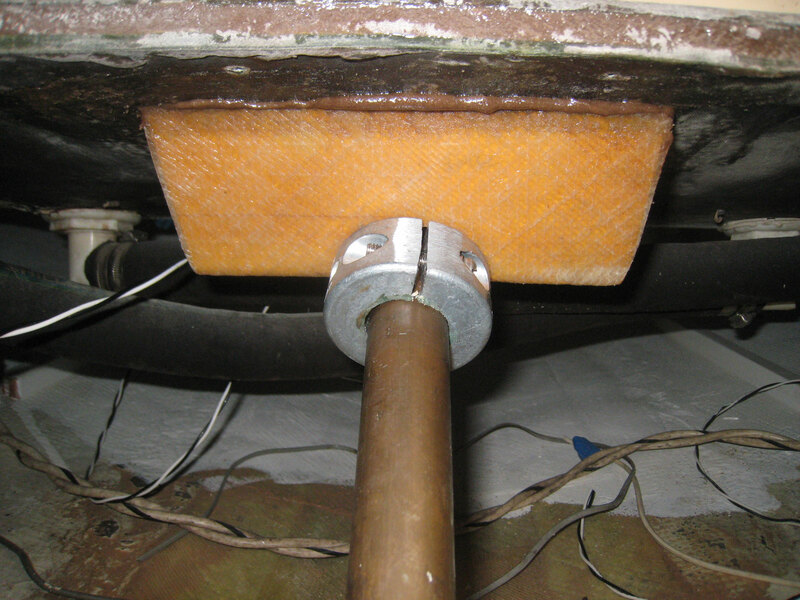 The second support is at the rudder stuffing box at the top of the rudder post tube under the cockpit. The third support is the cockpit sole rudderpost bearing. The height of the rudder shoe. 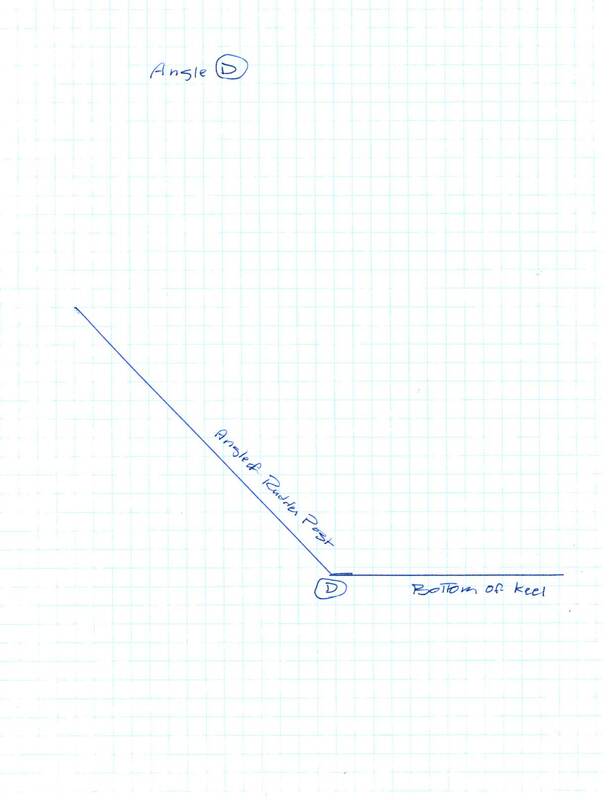 The length of the rudder shoe. 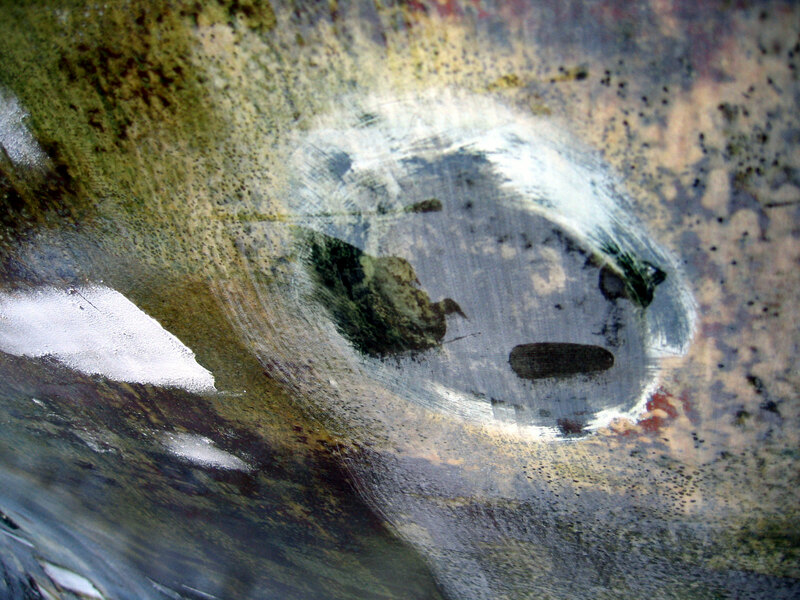 Detail of the top of the rudder. Click these thumbnails to enlarge. Some detail as to the rudder gudgeon and pintel. All the useful dimensions of the rudder including references to the pertinent angles (circled letters). Angle A is the angle at the aft bottom of the rudder. Angle B is the angle at the aft top of the rudder. 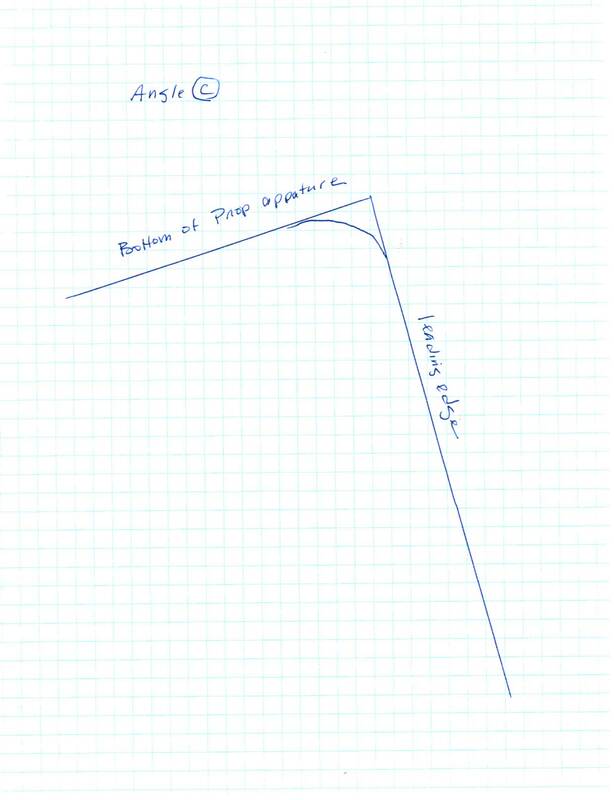 Angle C is the angle of the bottom of the prop aperture where it joins the leading edge of the rudder. 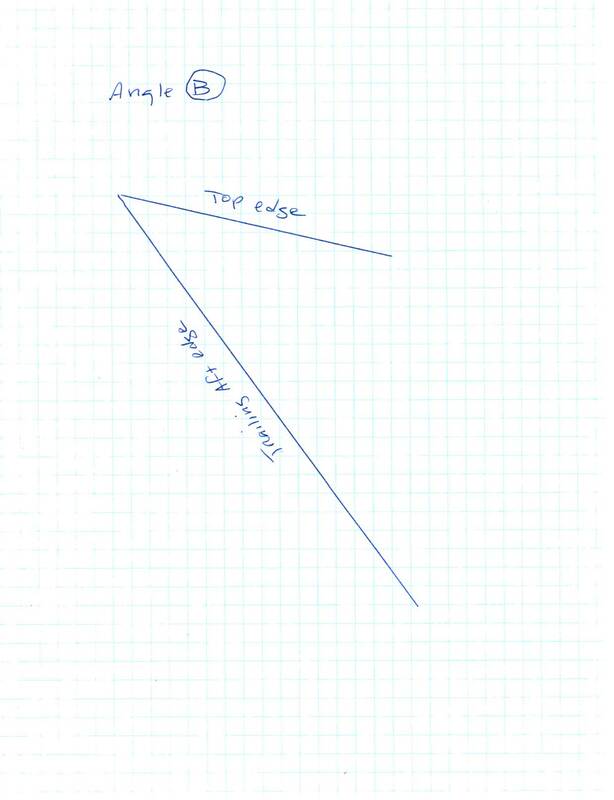 Angle D is the angle of the rudder post with respect to the bottom (horizontal) base of the keel. As part of this refit I decided to remove the old depth sounder transducer and the speed log and replace them with a combination Raymarine transducer. 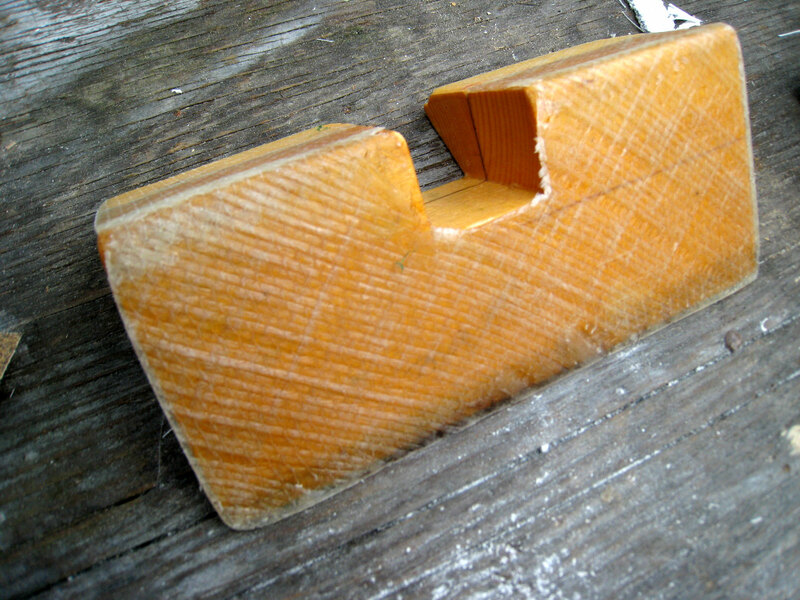 I cut a 2-inch hole straight thru the keel in the bow cutaway, and shaped the area fair for mounting the transducer. I built a small fence in front of the transducer to prevent it from picking up any weeds or line. I used a nylon collar to create a smooth, fair and square base. 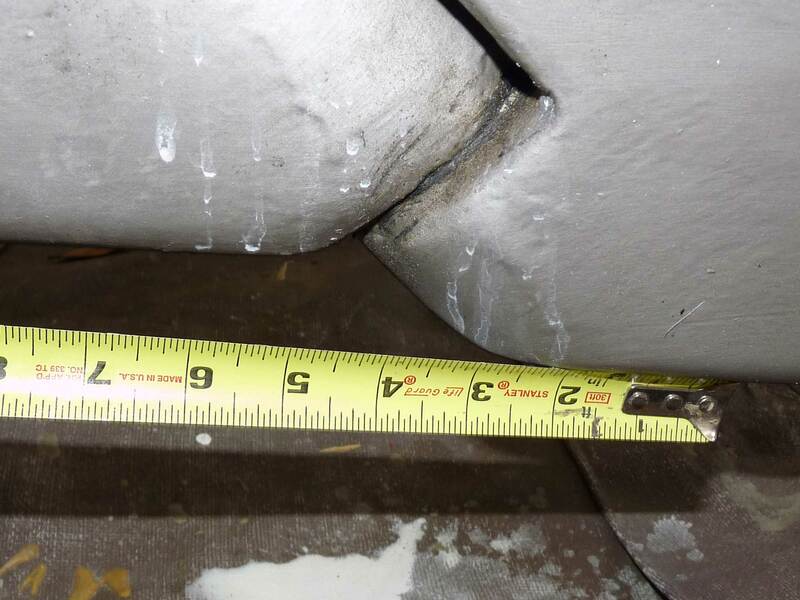 Here's the transdsucer caulked and installed. Apply 3 coats of West epoxy, roll and tipped, and sanded smooth. Apply 3 coats of West mixed with 422 Barrier Coat additive. Apply 2 coats of Interlux Primocon primer. 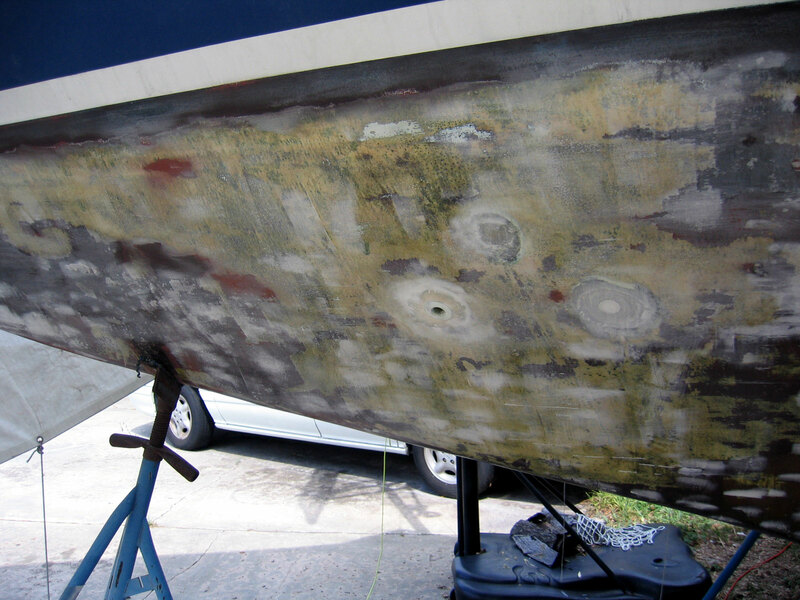 Apply 3 coats of antifouling paint. and attach it to your grease gun. If you have an air powered gun, all the better. 2. Lift your rudder up to expose the Pintel. Place some blocking under it so the rudder can't slip back down. You should be able to expose almost all of the pintel. 3. Inspect the pintel for wear and corrosion. Assuming it looks ok, insert the needle into the gudgeon cavity and pump it full of grease. 4. 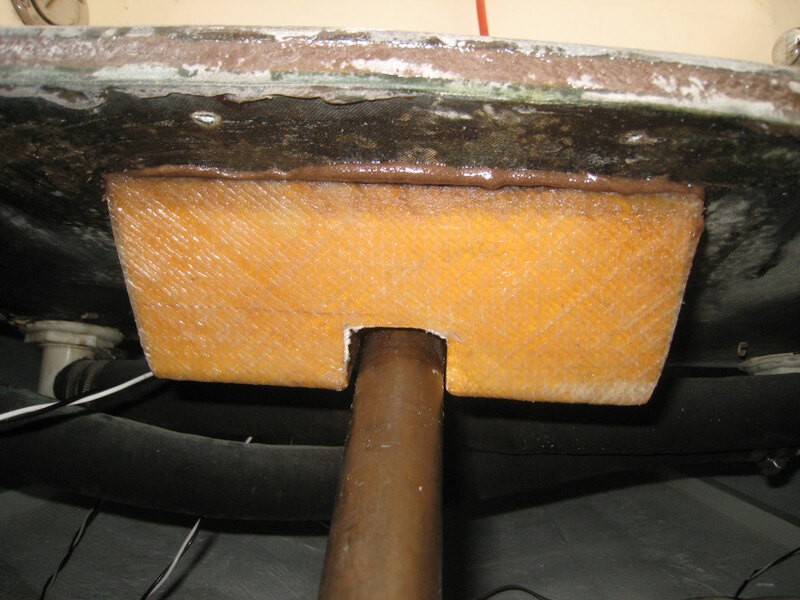 Remove the blocking and ease the rudder back down and rotate it from side to side to distribute the grease evenly. Clean up the extra that squeezed out. 5. Do this at each haul-out when you repaint your bottom. 1. 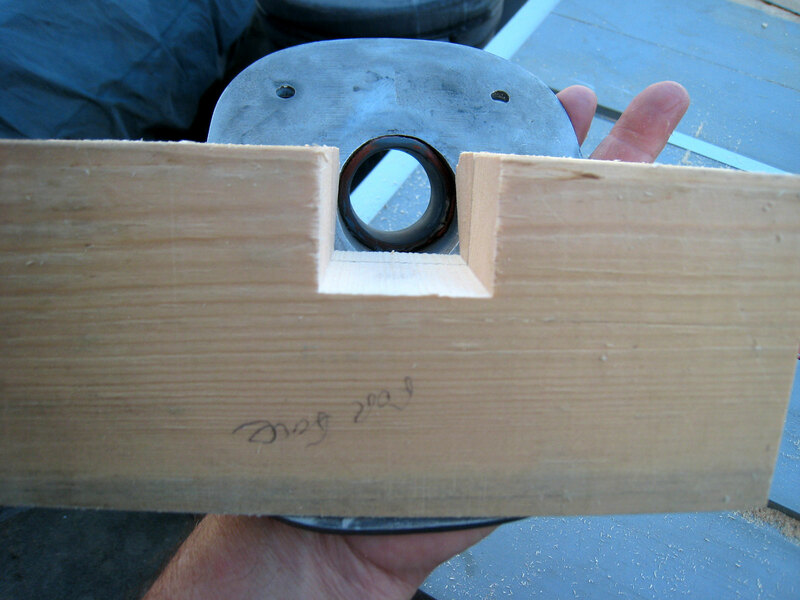 Build a collar base under the cockpit sole at the rudder post top bearing that is a wedge the angle of the rudderpost. I used some scrap white pine 2x4 glued together. The angle of the rudder post is exactly 45 degrees so I cut a wedge on the same angle, then cut the opening for the rudder post on the table saw. I am holding the rudder post top bearing that mounts to the cockpit sole. 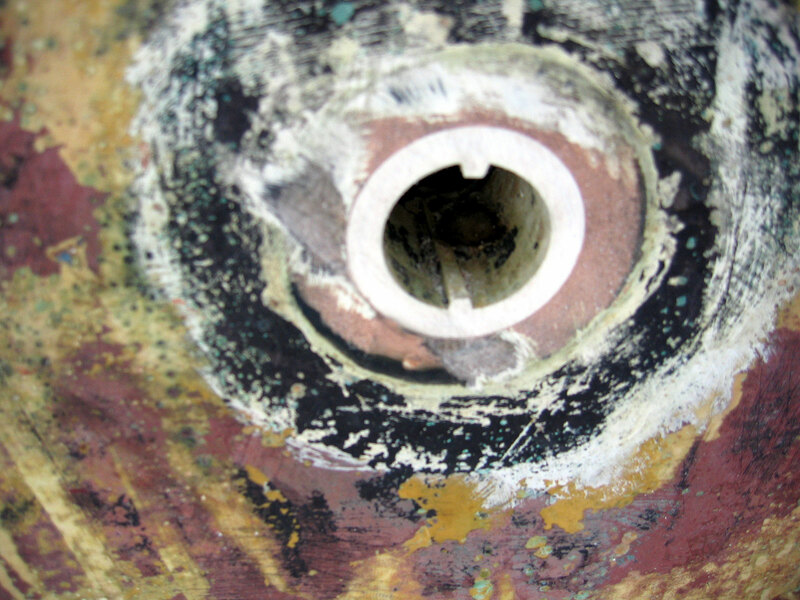 The sight line through the top bearing. I glassed it with two layers of 24oz biax for strength. 2. Mount it to the underside of the sole around the rudderpost. 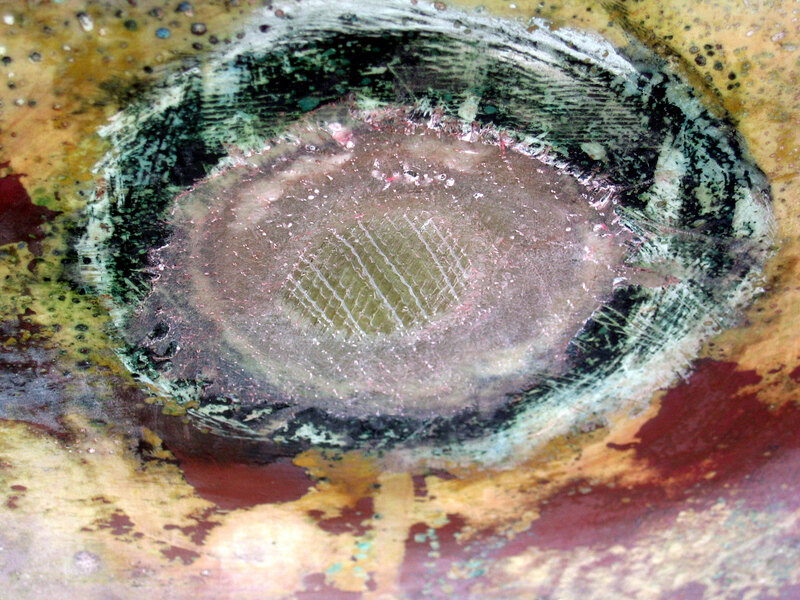 The base is glued to the underside of the cockpit sole in thickened epoxy. 3. 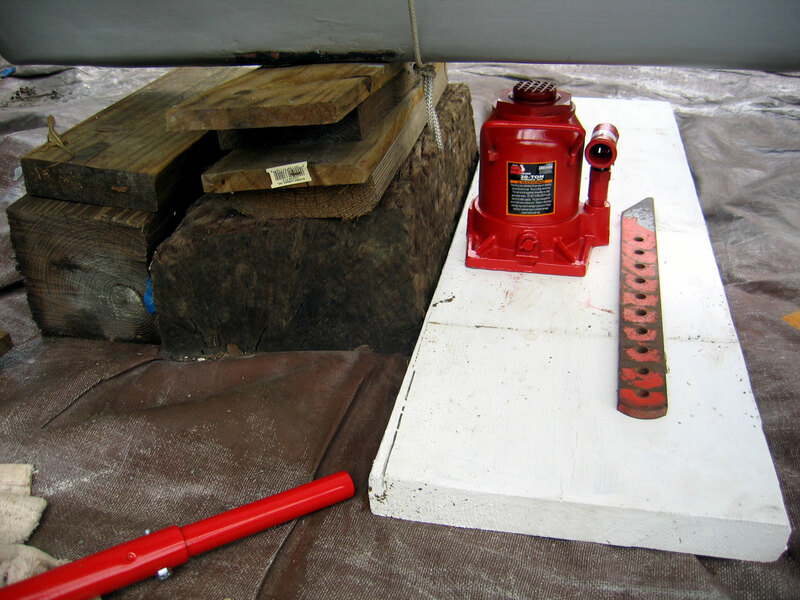 Attach a 1-1/4" collar zinc to the rudderpost positioned 1/4" below the base. 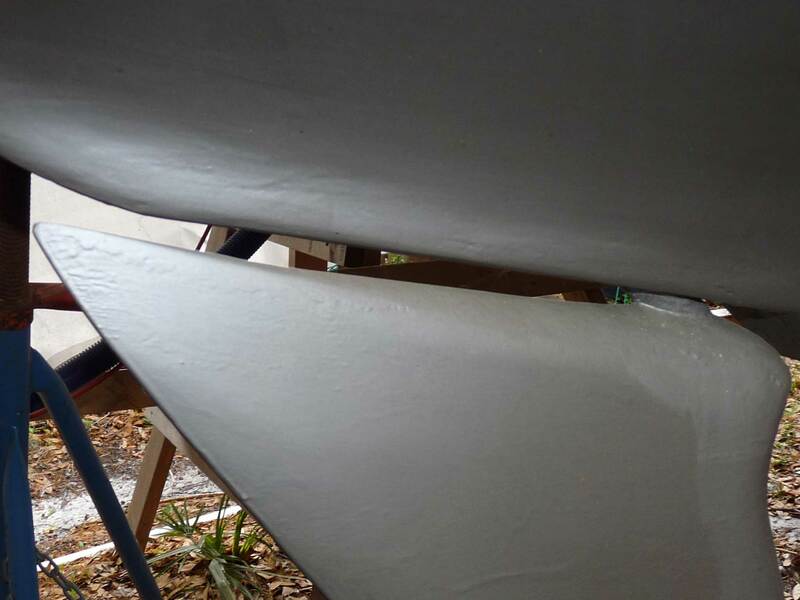 The zinc will prevent the rudder from lifting. Here you can see the zinc collar in place, about 1/4" down from the collar base. More info about the cockpit, the rudder and the top rudder bearing is here. 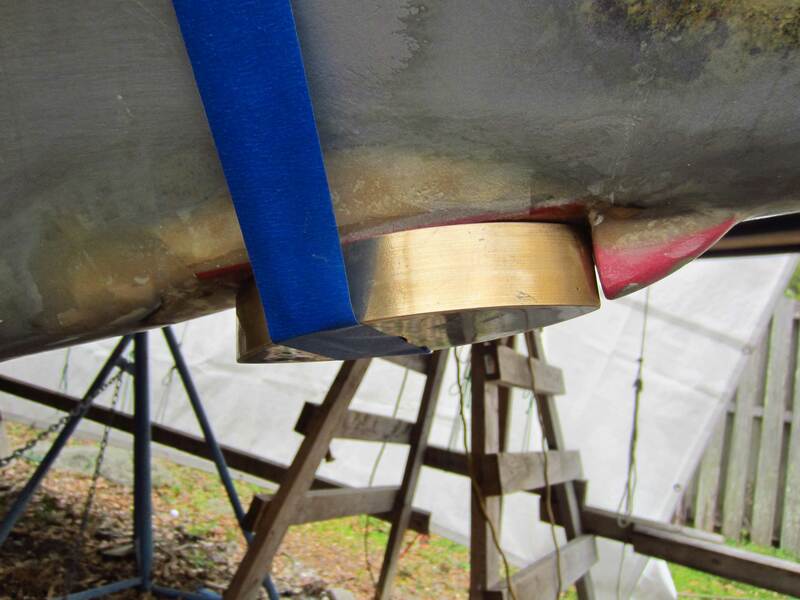 Info about the rudder stuffing box is here.